← #WhyBible – who am I? We’ve seen the impact the Bible has had on people the first time they hear and/or read the Bible in a language that speaks to their hearts. For those of us who have English as our mother tongue, we’ve had the Bible in a language that speaks to our hearts since 1526. Not only do we have a Bible in a language that speaks to our hearts, but we have hundreds of different translations and versions to choose from. 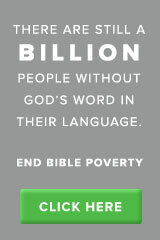 David and I have been serving with Wycliffe Bible Translators since 2008. One of our training times had an emphasis on creating stones of remembrance (Joshua 4) along our path because when things seem to be falling down all around you, you need to be able to look back at what the Lord has done and find encouragement. That in part, is why we started our blog so we had stones in a searchable manner that we could look back at. I also keep journals of these stones so I can look back. We’ve erected a lot of stones! When we didn’t reach 100% of our ministry budget within the first 100 days of 2016, I was discouraged! I was angry! I was hurt! April was our deadline of that campaign and we didn’t reach the goal. We started down a spiraling staircase. Not only did we not reach the goal, but others were sharing with us that they no longer wanted to partner with us, so the not only did we lack full financial support to pay our bills, but the support was dwindling. We cried out to the Lord time and time again, however, He wasn’t parting the waters for us to walk through. He wasn’t moving the mountain we needed Him to move. When our savings was depleted and we didn’t have enough to cover our bills, we hit bottom. I panicked and was paralyzed not knowing what to think, say or do. In June, we began working with a Partnership Development Coach within Wycliffe to come up with new ideas of increasing our support. We were surprised to hear that one of his later ideas was for one of us to seek outside employment to supplement our Wycliffe ministry budget. He assured us that sometimes this is necessary and that many other Wycliffe families serving in the US do this. This would allow one of us to continue serving with Wycliffe full time and the other to serve in a reduced role. David began searching for employment, however, doors weren’t opening. I trust the Lord to take care of us and looked back on our stone pile, however, I was getting very concerned about timing. In mid-August the floodgates opened – David went to an interview and was offered employment, when his income was added to our ministry budget that allowed us to reach 100% and allows us to begin serving in our roles with Wycliffe. It wasn’t the path we thought or even imagined, however, we can only see a small piece of the picture, while the Lord sees the whole picture. We are grateful for His mercy and that we can continue to serve with Wycliffe. I encourage you to keep stones of remembrance in your life to be able to look back on to help encourage you in your faith walk. This entry was posted in home, Wycliffe and tagged #WhyBible. Bookmark the permalink. I find that patience, while waiting on God for answers, in what I perceive as a desperate situation, is one of my biggest challenges (or stumbling blocks). The hardest lessons have been learned by “hitting bottom”. It is when I realize that I have no control or can’t “fix it” no matter how much I try, cry, or tantrum, that I crumble, am humbled, and truly give the situation to God. He is always faithful and answers in His perfect time. I am so happy that God has blessed you by providing the way for you to continue serving Him through your work with Wycliffe. I have found that the way I choose is not always God’s best way. If I don’t force the issue, but wait on God and remember how He has consistently provided in spite of the situation, I find great encouragement. May the reminder stones be a constant means of encouragement for us all.